The boring bit: Only available to residents of the UK. Your details will be retained by Wellesley Inc (owner of the Medinc brand) and you may receive communications from the Wellesley Inc group in future. Your details will NOT be shared with any third party. There are a limited number of these pens available and Medinc reserves the right to withdraw or change the conditions of this promotion at any time without notice. Please note we will only ask for your email on private chat, do not provide your personal address on facebook. If you are unsure if the email you have received is genuine please forward it to FreePen@wellesleyinc.com. 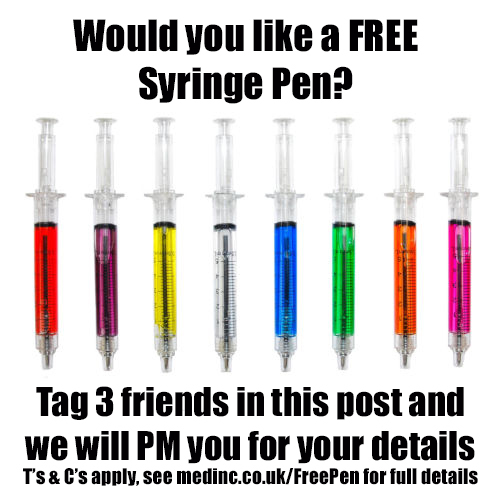 All we are asking in return for the syringe pen is to review the pen and let other customers know how good it is!